Last Saturday afternoon—after spending hours at the computer preparing handouts for the Mindful Nature Day Retreat—I hopped on my bike and headed to a favorite spot by the river. There’s an oak savanna overlooking the river gorge and (this won’t come as a surprise if you’ve been following me) I have a favorite tree that I like to sit under. It wasn’t easy to relax my shoulders after all that time at the keyboard, but I breathed and drew them down away from my ears. My monkey mind was hopping from branch to branch with all the thinking and planning I was doing for the retreat. I needed some time to be. That’s why I was there. Usually it’s easier for me to drop into BEing when I’m quiet in nature. To be present with what is, I bring my awareness to the moment at hand by letting all my senses take in the surroundings. The rustle of drying leaves twirling in the breeze and the acrid smell of their decay. The opposite bank, still aglow with fall foliage. Scaly bark grating my palms as I prop myself against the tree trunk. The monkey mind begins to settle. And I am grateful for the spaciousness that opens up for me when I give my awareness over to the moment in nature. Letting go of that tight grip on how things should be, I let myself be open to what is. I take a big breath and send out love to the space of beauty which I inhabit. Once this container is created for awareness, I acknowledge my heartfelt yearning about what I want to manifest in the world. This intention I hold in the fullness of the moment, in the crucible of an awakened connection to All That Is. The final principle comes without my doing anything. It happens when the first four elements of the practice (though they do not need to proceed in a linear fashion) are in place. Last Saturday, standing under the tree BEing, I sensed a presence off to my left. Turning to look over my shoulder I saw something 4-legged about the size of my terrier…a dog? a cat? A fox! The vixen pounced at the earth (they eat insects, as well as small mammals I learned later). Then she twirled about, nose whirling over her left shoulder, sat down and started scratching her chin. Very much like my terrier Dewey. But, as wild as he can be, this was a whole other thing to commune with an animal of the field and forest—even one so well adapted to urban life. Though I wanted to get closer I didn’t dare move and scare her off. So I watched from my spot by the tree. I was charmed, enthralled and watched her antics for several minutes. Though she showed no signs of sensing me I felt our interconnection, sharing that mindful space. That place of sensual aliveness. When the fox began to walk down the path, back toward the parkway, I came from around the tree and watched. A woman walked past, unaware of the wild thing in our midst. The fox sat and scratched some more. Finally she slipped back into the residential area again (I’d heard of recent sightings in yards on the Mississippi River Parkway). She looked right and left before crossing the bike path, then disappeared from my view. 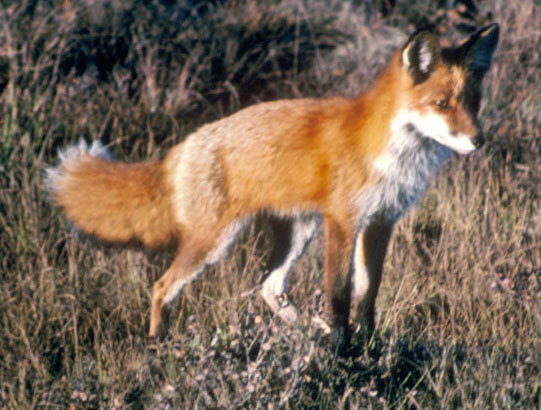 Fox medicine, in the Native American Medicine Wheel, is about camouflage, blending in. She certainly did, and it seemed to give her a lightness and confidence in navigating the world, despite her small size. Why was this totem coming to me when I’m trying to increase my visibility, getting my teachings and message out into the world to more people who can benefit from my work? Is it time to be more playful, less ponderous? Is it about being in the world but not of the world? Navigating life’s challenges and coming out unscathed? I haven’t seen her again. It seems these encounters come when the conditions are right, but can’t really be sought after. When I’m mindful in nature I simply seek to BE and whatever shows up tends to dazzle me, whether it’s a golden leaf on the path, an eagle swooping overhead or an eddy on the river that looks like characters in an ancient script. What dazzles you? What speaks to you these days, in nature or elsewhere? What messages or synchronicities are appearing in your life? Please leave your comments below and feel free to share the blog on Facebook, Twitter and with friends. New session of Gentle Yoga starts very soon. Get all the info here. Thanks for this, Milissa. I think Fox might be my totem, and your wise words have resonated with where I am lately. Was at Hidden Falls park today, and a Bald Eagle soared overhead. Fox is such a playful totem…I can see that in you Jodi! I love Hidden Falls and always feel my heart soar when I see an eagle. Isn’t it wonderful how much wildlife we have in the city now?